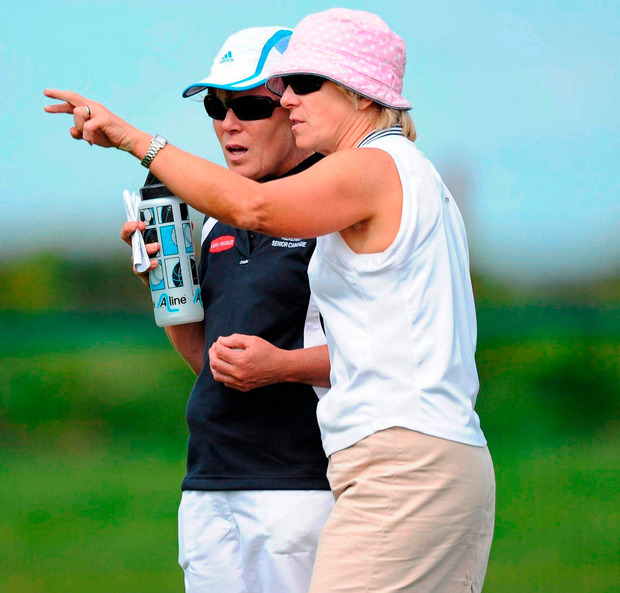 When Ann Downey knew she was going to take the job of Kilkenny senior camogie manager in November 2015, it took her a few weeks to break the news to her twin sister Angela. After they finished playing with a tally of 12 All-Ireland senior medals each, Angela told Ann to take time out for herself. But spending four or five hours walking a golf course did nothing for Ann. She was jumping back in and she wanted her sister there with her. There are peas in a pod and then there's Ann and Angela Downey. When they were kids, Angela went to boarding school after they finished the Inter Cert but Ann didn't. "I suppose I was my father's pet so I wasn't going any place," Ann recalls. "Once she went, I missed her so much that they realised I was lost without her and I ended up going to boarding school with her." In 2004, Angela - widely recognised as the greatest player in camogie history - was named in the 'Team of the Century' but she didn't attend the banquet because Ann wasn't included. Ann and Angela ring each other every morning just after 8.0am and visit each other every day. Ann drops her dog, Jack, into Angela's home on her way to work and when Angela is off school during the summer, Ann goes to her home every day for lunch. "If I hadn't heard from her or if she hadn't rang at a certain time, I'd be worried," Ann says about her twin. Ann, who was born before Angela, knew the best way of bringing Angela on board with Kilkenny camogie again was by first asking Breda Holmes. Angela and Breda played together in the forwards for the Kilkenny team which won seven All-Irelands in a row between 1985 and 1991. "The work they do, it makes my life easier," Ann says. "I don't have to think about collecting the milk, the jerseys, getting the water. They're great to give a word of encouragement, especially with the forwards." Angela is on the sideline with water bottles during games. "I'm just a minor in the background. But I do, I get totally wrapped up in it. I'm kind of hitting every ball, I'm roaring like a fish woman and probably saying the wrong things," Angela says. "I might say 'drive it' and they're not supposed to drive it, they're supposed to carry it and pass it off." Does Ann ever tell you to be quiet on the sideline? "She does. Two years ago, we were playing Cork in a league game. And she came up the line and said: 'shut up, you're telling them one thing and he's telling them another thing, so shut up'. So, I duly shut up," Angela laughs. Of course, sisters get away with saying stuff to each other that they wouldn't dare say to anyone else. This week Angela has said to Ann how wrecked she looks because of the amount of work she's doing before tomorrow's All Ireland final. All summer Angela has been on to Ann about taking a holiday but Ann didn't want to because she's taken a week off in previous summers. "She's always trying to do something better than last year," Angela says. Only those closest to managers and players see the unseen work. When Ann sends a WhatsApp message to the players asking them what they would like to eat before a game, Angela gives out to her if she frets over not hearing back from a player. Angela sees her sister trying to organise pitches for the girls to train, sees her organising food, sees the girls put €2 each into the kitty at every training session, she sees all the kind of things an inter-county men's team would never have to worry about. And Kilkenny are seen as one of the well-supported camogie teams when it comes to the relationship with the men's county board. However, Kilkenny camogie still don't have their own training pitch, no place to call home. They remain dependent on clubs like James Stephens for facilities or her own club Ballyragget which gave them the use of their pitch for a championship game earlier this summer. Angela believes ladies' football is "leaving camogie sitting on their backside" with the kind of sponsorship and TV exposure it gets. She remembers the picture of herself on the front page of a national newspaper the day after they won the 1989 All-Ireland final, with the headline: 'Cat with her skirt down'. "It wasn't the fact that we were playing in an All Ireland final, it was the fact that I had no skirt on!" Angela smiles at the memory of her celebrating a goal and then looking down and realising her skirt had been taken off by the corner-back. As they hope for a repeat of 2016, when they beat Cork in the final, Angela just wants to be there for the team and her sister. "If I say the wrong thing I might upset her. And inevitably I'll put my foot in it, so I'm there if she wants me," Angela says. And just as she says it, Ann is ringing her on the phone. The first time Angela played in an All Ireland final in 1972, as a 15-year-old, Ann didn't make the Kilkenny panel but was there to cheer on her sister. Tomorrow the twins are once again back in Croke Park. A lot has changed but some things stay the same.